The town-bound lanes of Likelike Highway's Wilson Tunnel will be closed for a second day today as contractors continued to remove debris after rocks fell near the roadway earlier this week. 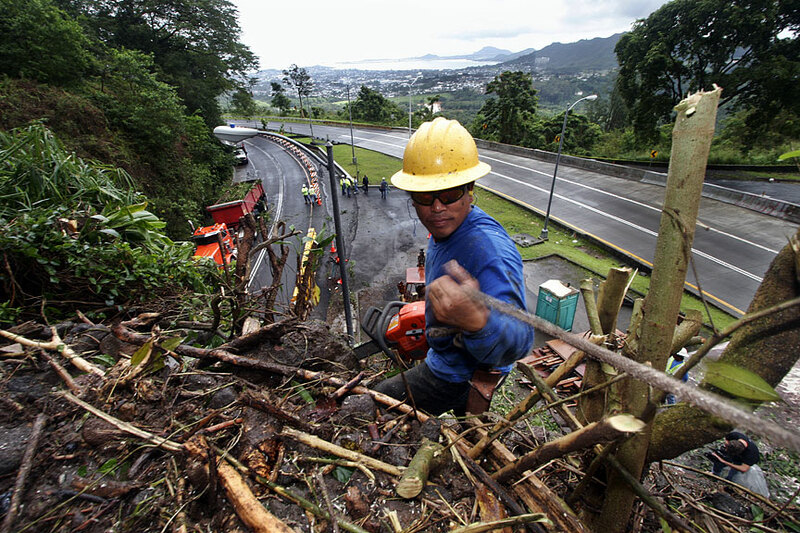 Removing debris is a precautionary measure as more rain is predicted in the coming days, said Scott Ishikawa, spokesman of the state Department of Transportation. Small softball-size rocks fell near the town-bound lanes late Tuesday. The state hired Ideal Construction Inc. to clear debris, vegetation and mud that clogged a drainage ditch above the entrance of the Wilson Tunnel. Workers will use excavators and chain saws to clear about five to 10 large truckloads of vegetation and debris. "If more debris comes down on the hillside, it won't go onto the roadway," he said. State transportation officials conducted a visual inspection around the area of the rockfall and determined there were no other areas that posed a hazard to motorists. Ishikawa said they plan to decide today whether additional days are needed to clear the debris above the Wilson Tunnel.